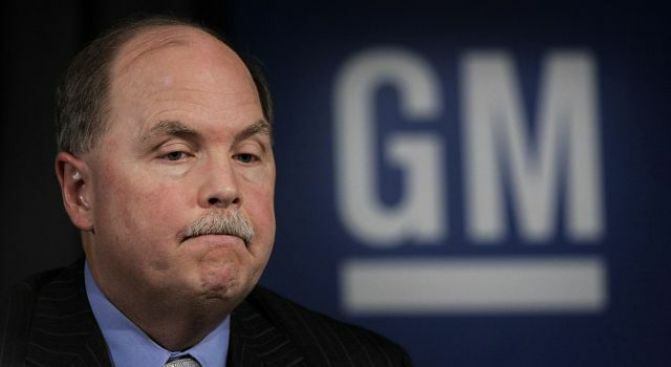 It's looking more likely that GM CEO Fritz Henderson will have to reorganize the company under bankruptcy protection after bondholders balked at settlement offer. General Motors all but conceded it will go into bankruptcy after several key bondholders balked at a debt-for-equity swap, but if Chrysler's filing is any guide, a protected reorganization could be swift and productive. GM faces a June 1 deadline to get its creditors to agree to take a 10% stake in the company in exchange for the $27 billion worth of GM bonds they hold. A committee representing GM's biggest bondholders — mostly big banks and other institutional investors — has opposed the debt-for-equity swap from the start. "It wasn't particularly generous" to the bondholders, Shelly Lombard, senior credit analyst at New York-based bond research firm GimmeCredit, told The Associated Press. "I think it's one of those things where GM now figures bankruptcy is inevitable." John Pottow, a professor at the University of Michigan who specializes in bankruptcy, said GM evading bankruptcy now is almost impossible. "They said no. That's it. They tried. That's why they're going to have to file for bankruptcy," Pottow said. The bankruptcy option could leave as much as 70% of GM in the hands of the U.S. government, which is pumping as much as $50 billion into the company. Another 17.5% of the company would go to the United Auto Workers union's health care trust fund, and the Canadian government would also hold a small stake in exchange for an $8 billion infusion. The Obama Administration has said it would look to divest itself from GM as quickly as possible should the company survive the bankruptcy process. GM would need the cash to pay off the bondholders and continue operations while it reorganizes. But while sources seemed resigned to a bankruptcy filing, the company could extend the deadline for bondholders to take the deal. The company has said the government is pressuring it to not increase its offer above the 10% equity stake. As GM prepares to go into bankruptcy protection, Chrysler is about to emerge as soon as next week, according to Bloomberg News. The restructured company initially expected to remain in bankruptcy for two months when it filed April 30, but has been able to restructure much more quickly than anticipated. Still, Chrysler's future is dependent on a sale of most of its assets to Italian carmaker Fiat. Chrysler's experience could give heart to GM, as the company's sales have not faltered while under bankruptcy protection. That could indicate that consumers believe Chrysler and possibly GM can survive a bankruptcy filing, and warranties will be honored for new buyers.